Raised in a large family back in Michigan, Jerry developed a strong work ethic early in life. He soon knew he wanted to be a cowboy, and at 22 years of age, he began roping calves under the tutelage of Gerald Kummer. He enjoyed success as a calf roper, qualifying twice for the Mountain States Circuit Finals. An excellent horseman, Jerry trains his own horses and has four of the horses he trained competed on by NFR cowboys. Married in 1992, Jerry and his wife, Andrea, responded to a strong calling from God and began full time ministry in 1997. Their ministry took them to rodeos in Cheyenne, WY, Dodge City, KS, the New Mexico State Fair, the Mountain States Circuit Finals, and the NFR in Las Vegas, NV. They have ministered at various rodeo Bible camps, Cowboy Churches, and even at the men's prison in Madras, OR three different times. Cowboy Connection Ministry is a logical, natural merging of Jerry's love of rodeo with his and Andrea's faith in God. In 1995, he joined NSPRA and competed for 21 years, working CR, RR, and TR, and winning the Runner-up Calf Roper Title three times. 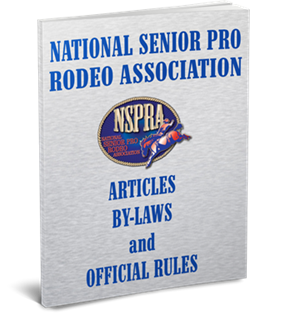 Once Jerry turned 40, they began traveling extensively with NSPRA and held cowboy church services at many of the rodeos. They have had funeral services for NSPRA members as well as weddings. For six years, Cowboy Connection has sponsored a church calf roping for any contestant over 40. A testimony to the strength and power of their faith is Andrea's recovery from a stroke. The care that Jerry gave Andrea, combined with their faith in God, resulted in what many call a miracle. Andrea can now ride a horse and do most of the things she did prior to the stroke. Jerry gives Andrea much of the credit for his success. Cowboy Connection Ministry Mission Statement: To be a source of encouragement and a demonstration of God's love to every cowboy, cowgirl and rancher. To provide for them the opportunity to hear the word of God preached at a place they feel comfortable, whether it be the arena, the grandstand, under the awning of a trailer, off a horse, in the barn - any place in the great outdoors.